A new, quieter hammer for driving huge piles into the seabed for offshore wind turbines has been successfully tested at sea. SSE is one of the partners in the project to develop the Blue Hammer. The energy giant is involved in the construction of Scotland's largest offshore wind farm, the Moray Firth's 84-turbine Beatrice Offshore Windfarm. Blue Hammer has been designed to make less underwater noise, which can cause disturbance to marine life. 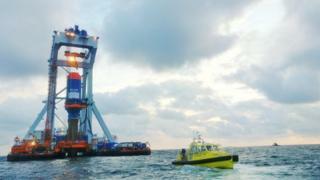 The new design, which has been tested off the coast of the Netherlands, removes the need for underwater noise mitigation measures, and the time and expense involved in putting these in place. The Carbon Trust and offshore foundations company, Fistuca, have been working with SSE and others on developing the hammer as part of the Offshore Wind Accelerator (OWA) Blue Pilot project. The OWA is a flagship Carbon Trust research and development programme. It involves offshore wind farm developers and is part funded by the Scottish government. Michael Stephenson, of the Carbon Trust, said the test at sea of the new hammer was "another step forward" for the Blue Pilot project.